The past few days have been gloomy with the skies overcast with rain clouds. It felt great to wake up to a bright sunny day and a blue sky this morning. Definitely sets the mood for the day. Hubby dear usually comes home from work for lunch, today he called to say he was way too busy in meetings to come home, so it was just me. I hadn't planned what to make and was not quite eager to make anything elaborate. Moreover I wanted a break from the usual rotis and rice. So I made a hearty omlet with white beans topped with toasted sesame seeds. It made for a perfect meal for one. Heat the olive oil and sesame oil in a 6-inch oven proof pan. (Cover the handle with foil if you are not sure about the pan) Add the onions, pepper and celery. Cook until soft and done. Add the beans and continue to cook for several minutes to heat through.Sprinkle with red chilli flakes and season with salt and pepper. In a medium bowl, beat the eggs with a fork and season with salt and pepper. Pour over the ingredients in the pan. Stir the egg mixture with a flat wooden spoon until it begins to stiffen. Allow to firm up over low heat. 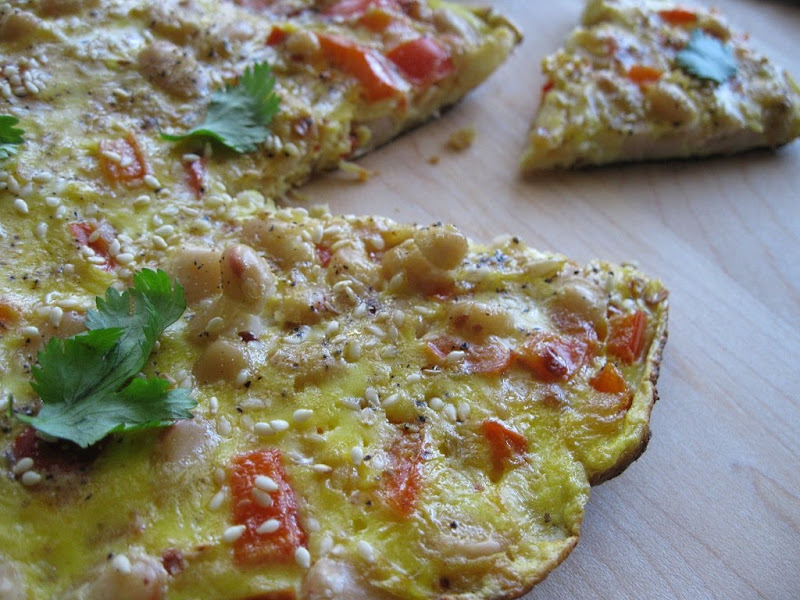 Sprinkle the omlet with the sesame seeds and place the pan in the oven. Heat for 5 minutes and then turn on the broiler. Brown the seeds evenly and then remove from oven. Cut the omlet into wedges and serve immediately. The crunch from the sesame seeds was great and the hint of sesame oil made it different from the usual omlet. Not bad for a quick, on the spur meal! 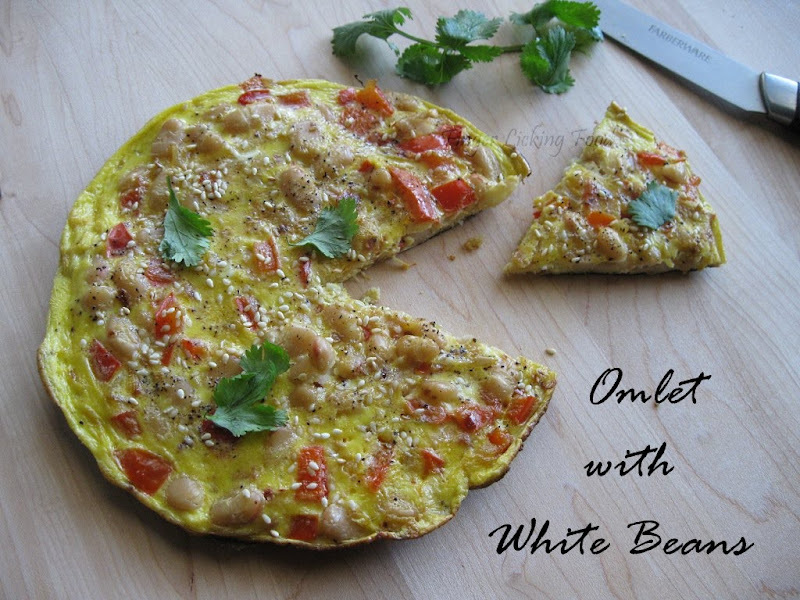 The picture of the omlette is beautiful and it looks yummy and delicious. I love making different types of omelets. 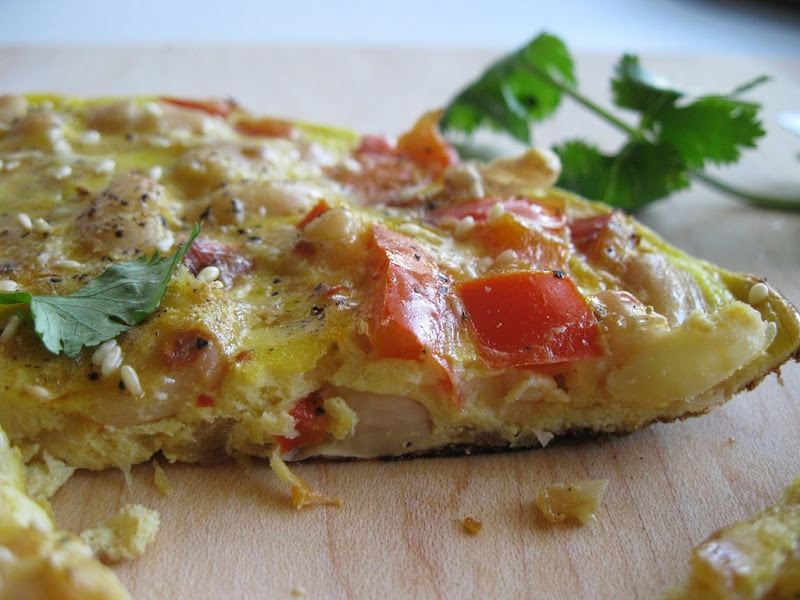 Your omelet looks so yummy and easy to make but I know it's hard work. Thanks for sharing! Yummy!That is a really cool idea, comes handy. Hi Namratha, first time here. You have a nice space and its so good to see so many Karnataka recipes here! The pic of the omlette is perfect! Never made omelettes with beans nor used sesame seeds in them before. Interesting. Love, love, love the clicks! Beans and sesame seeds I imagine the taste, looks pretty! Lovely omelette. I really should cook more with white beans.